With a crescent-shaped shoreline, grand hotels by the cliff, and white sand that calmly meets the turquoise blue water, Playa de Amadores is a tropical paradise straight out of a romantic movie. This divine human-made beach, 800 meters long by 30 meters wide, is the best place for picture perfect moments. Lovers happily stroll hand in hand along the gorgeous promenade while the palm tree leaves sway gracefully with the wind. Meanwhile, children playing mischievous games and run around on fine white sand having the best time of their young lives. Old couples, on the other hand, lounge by the beach and looking out to the vast blue sea thinking they spent their retirement savings in the right place. Singletons on their prime and perfectly fit swimwear hoping their summer romance never end. In the beautiful Playa de Amadores, beautiful things happen. Before the turn of the 21st century, the stunning Playa de Amadores was a barren rocky shore with ash gray sand in the municipality of Mogán. Not exactly the paradise it is today; however, all that changed by 2002. Playa de Amadores, created with crushed coral sand dredged from the south coast, is the third artificial beach on the island. It is also the answer to the overcrowded Puerto Rico beach. Nestled between two tourist powerhouses, Puerto Rico and Puerto Mogán, it would seem that Amadores was fated to be something other than desolate. 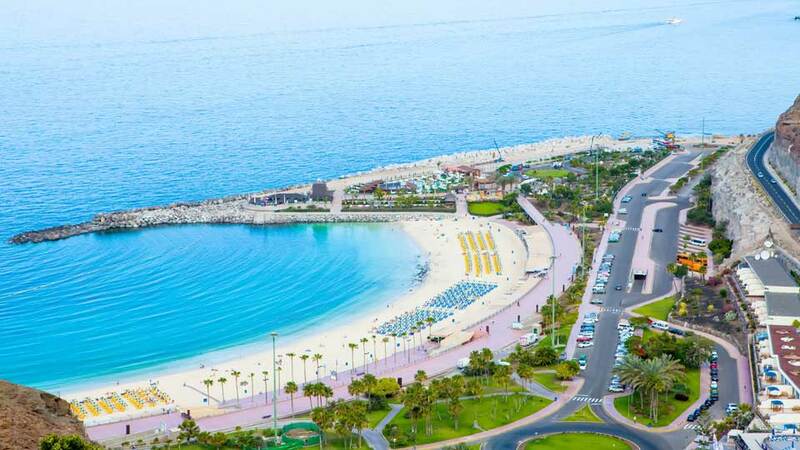 But the grand concept turned into a magnificent manufactured wonder, and the crescent-shaped seafront wonderland has since become one of Gran Canaria’s best beaches. The dazzling Playa de Amadores means “The Lovers Beach.” Although aptly named as it is indeed a favored destination for twosomes, romance is only one of many things one will find in its white sandy shore. With the plethora of entertaining activities available in this marvelous resort, the best is yet to come. Instead of shivering under the harsh European winter, basking under the Gran Canaria sun on a stretch of beautiful white sand is the most relaxing activity in Playa de Amadores. Although there are lots of activities around, this is the first thing most tourists do, and they can’t be blamed. Lounging on the beach while admiring the glorious views of the clear turquoise water and towering cliffs where fancy hotels stand is just divine. Is there a better way to get that tan? But how about when the sand gets too hot? Being made of coral sand means people can lie on the beach no matter how hot the day is without getting burned. They can also use their colorful beach mats or towels, or rent parasols and loungers. All they have to think about is if they want to get a tan or not. Because Playa de Amadores is a cove, the bay is calm and well-protected from the rough waves of the open sea. As such, it is an excellent place for swimming and paddling. However, for families with kids who can’t swim yet, be wary of the sudden end of the sand covered beach. As it is artificially made, the shallow part where people, most especially kids, happily walk on is rather limited. Tourists can also snorkel or scuba dive to appreciate the underwater beauty of Amadores. For snorkeling, the areas near the breakwaters are wonderful, especially in the early morning when the water is clear. For diving, or renting pedalos, head to the east end of the beach. The promenade of Playa de Amadores offers a great view of the resort and is the best place to take leisure walks, jog, or go people watching. The view from the concrete path of people lying down or playing by the beach like confetti on the floor is splendid, while the natural beauty of the cliffs and blue waters harmoniously co-existing with the man-made cove and palatial hotels is simply awe-inspiring. In the morning, the boardwalk is full of people jogging or practicing all sorts of sports. During the afternoon, leisure walkers of every age roam around. Once the sun sets, the romantics walk hand in hand with a view of the gleaming hotel lights and the vast dark sky filled with sparkling stars. In this beautiful promenade, the walk is just much more special. Playa de Amadores offers tourists the best seat in the island to watch the sunset. The view of the sun disappearing behind Mount Teide on the neighboring island of Tenerife, while the skies are nearing red and seemingly touching the high cliffs of Amadores should not be missed. People lying on the sand, playing in the waters, or walking by the promenade all stop to witness this majestic sight. From the island capital Las Palmas, there are two options to get to Playa de Amadores which is situated in the Mogán municipality. The first choice is to hire a car or hail a taxi and travel along GC-1 for half an hour. The second option is to get on Global Bus No. 91 to Puerto de Mogán. Once there, proceed to the bus terminal at the back of the Spar Supermarket and take Bus Nos. 1, 32, or 33 (they all stop at Playa de Amadores). Taxis and ferries are also available. From Puerto Escala marina in Puerto Rico take a one km walk in the cliff top path leading to Playa de Amadores. This will take around 20 minutes. If coming from Playa del Cura, just walk along the track that connects Tauro beach and the Playa de Amadores breakwater. There are plenty of beautiful hotels in and around Playa de Amadores. Some stand by the cliff and offer a full view of the wonderful cove and amazing surroundings while others are a bit farther from the beach but nearer to other places of interest or have better amenities. Other choices are apartments. Clearly, the options are limitless. Just a 4-minute walk away from Playa de Amadores, the Gloria Palace Royal Hotel & Spa in Costa de Mogán is a popular choice for travelers who want luxury and an incredible view of the cove, the vast sea, and the surrounding cliffs. This beautiful hotel has an infinity pool with sea views and other great amenities such as an indoor pool, hot tub, gym, and spa. The Serenity Amadores is an elegant apartment complex that is just a 5-minute walk away from Playa de Amadores. Each of the apartments has one bedroom, a comfortable living area with TV, a small kitchen, and a large terrace with a full view of the mesmerizing beach. The complex also houses its mini market and offers professional massage. The Holiday Club Vista Amadores is a 9-minute walk away from Playa de Amadores and is situated high up overlooking the beach. Although it is the farthest one on the list, they offer a free shuttle service, and the spectacular views from the hotel are definitely worth the distance. They also feature great amenities such as a year-round outdoor swimming pool, area for table tennis and darts, sauna, and a fitness center. 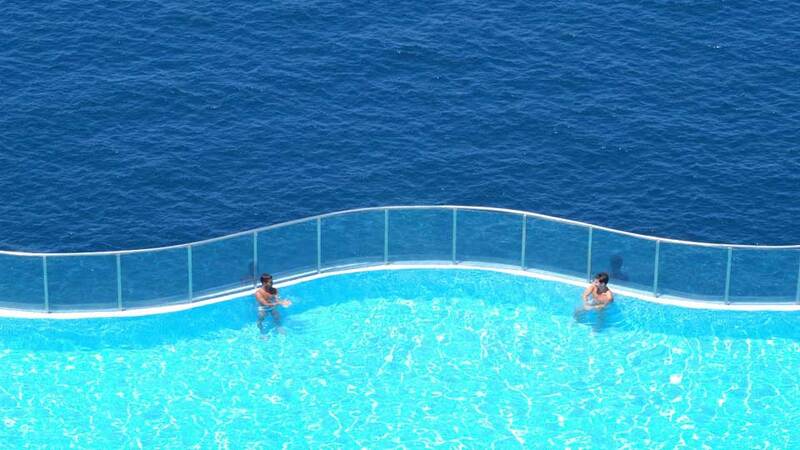 The Holiday Club Jardin Amadores has a panoramic view of the Playa de Amadores. Although quite near to the beach as it’s just a 6-minute walk away, the hotel still offers a free shuttle service. Guests may play squash at the hotel, swim at their year-round pool, or dine at their on-site restaurant. There’s never a shortage of incredible food and restaurants in Playa del Amadores. Whatever cuisine one is craving for, there’s an excellent chance it is available in or around the area. 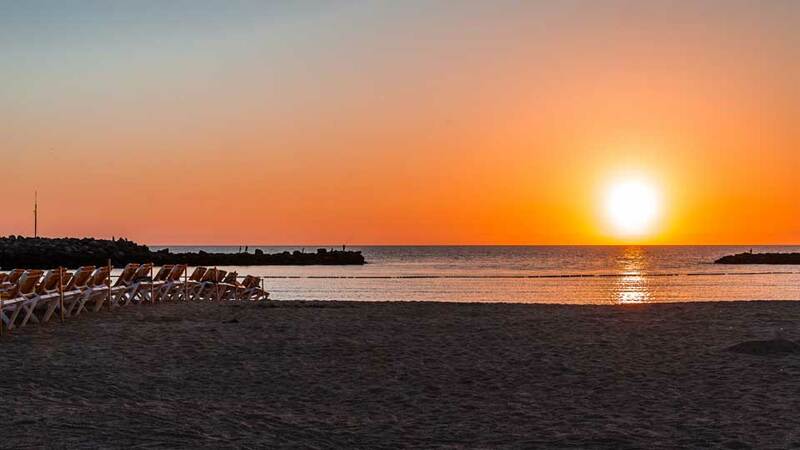 From burgers and pizzas to Spanish and other European dishes, or even exotic ones, the man-made beach and the neighboring puertos can satisfy the hunger pangs of the beachgoers. Nestled right on Playa de Amadores, Webers Restaurant offers delectable food as well as lovely views. Make sure to try their best sellers: ribs, pork shawarma, tapas, and any of their excellent burgers. Diners can also enjoy their food while listening to cool music. The VIP Pizza Restaurant makes the best pizza in Playa de Amadores. Be sure to make a reservation as the place is always fully booked, but, should there be no available seats, they can also do take away. Aside from their fantastic pizza, diners also love their garlic bread, bruschetta, and profiteroles. The Beer Harbour Restaurant makes the best burgers in Puerto Rico and has a fantastic selection of craft beers. Aside from their delicious burgers, their other must-try are mushroom and goat cheese bruschetta, mozzarella sticks, chicken wings, steak, zucchini tempura, salmon fillet, and ribs. It’s not located in Playa de Amadores, but it’s still pretty near. This restaurant is packed most nights, so it’s best to call for reservations. For a fantastic authentic Greek cuisine, Rhodos Palace Restaurant is well-regarded. Located in Parasella Shopping Centre in Puerto Rico, it is only a couple of minutes away from Playa de Amadores. Try their best-sellers: seafood saganaki, prawns, salmon fillet, steak, Rhodes plate, chicken gyros, spicy baked feta, moussaka, stuffed vine leaves in lemon sauce, pan fried zucchini with tzatziki, Kleftico lamb, or lamb Kleftiko, and pair it with Rioja. 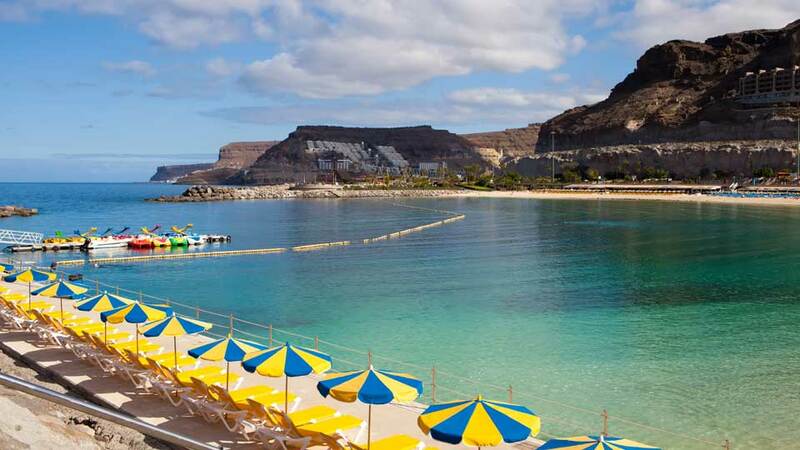 Sitting on the white coral sand of Playa de Amadores, it’s hard to imagine it to be anything but natural. Tranquil turquoise waters and the endless blue sea beyond the cove, massive cliffs that surround the bay, and grand hotels that stand on solid rocks. One could only think that this perfect resort was specially created to make vacation dreams come true. A proposal by the hotel balcony with the sounds of the waves in the background and stars sparkling above, the single mother watching her laughing kids splash sea water on each other, and an old couple on their first vacation in years strolling by the shore. Truly, Playa de Amadores is the best backdrop for the moments that count.